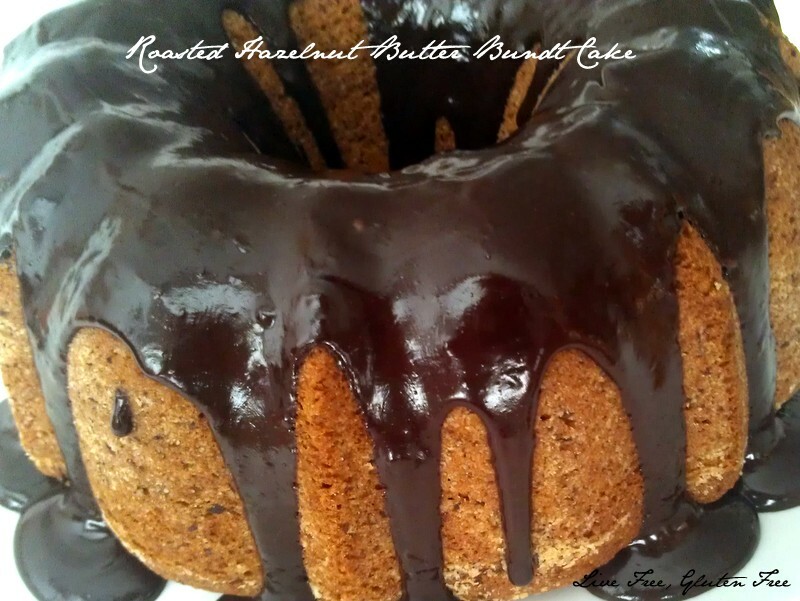 You know that blog recipe contest I posted about last week? I decided I needed to enter it, too. So, I got experimenting with grapeseed oil, and what I got was an incredibly easy biscuit recipe. 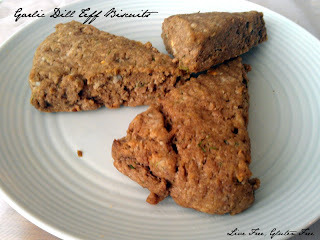 These biscuits are amazing! 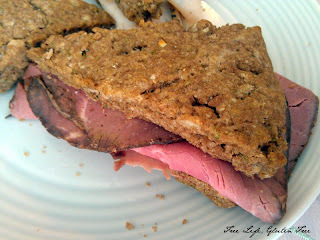 I wanted my teff sandwich bread for sandwiches this weekend, but didn't have the time or energy to make it. These biscuits were a great substitute in fact the garlic and dill in those biscuits made for the best sandwich I've had in a long time! 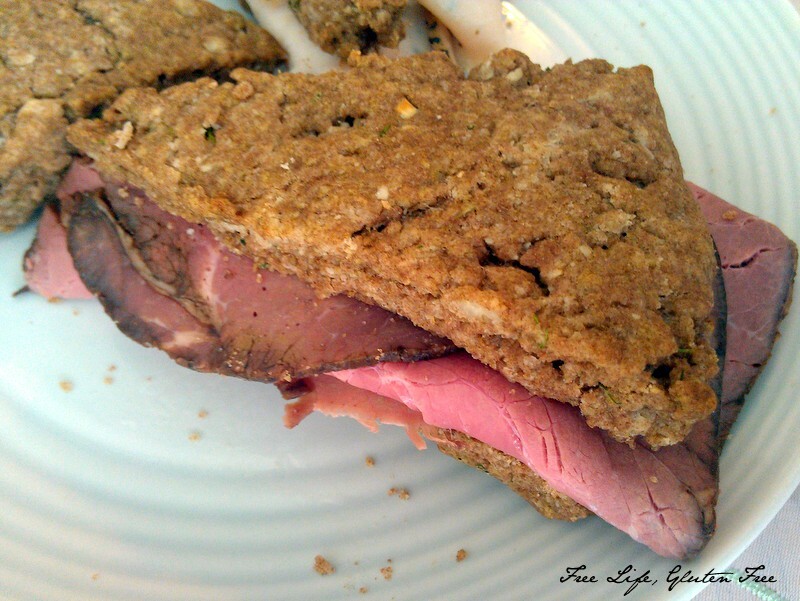 This post was shared on Slightly Indulgent Tuesdays, Gluten Free Wednesday, Allergy Free Wednesday, Allergy Friendly Lunchbox Love, Gluten Free Fridays, and Whole Food Fridays. In a medium mixing bowl, combine all of the dry ingredients, including the dill and garlic. Add in the milk and grapeseed oil and hand mix until combined. My Grandma died yesterday, so we may not follow this plan at all, but at least I know I'll have the ingredients I need on hand in case I am home to make it. I also have onions, garlic, and russet potatoes. I am always looking for ways to improve my eating and cooking habits. I cook a lot with olive oil, but there are times were olive oil won't work, because of it's low smoke point. I had heard a little about grapeseed oil, but hadn't ever gotten around to trying it until recently. Grapeseed Oil has similar health benefits to olive oil, but it has a higher smoke point and a light taste, making it much more versatile to work with in the kitchen. So, if you're a food blogger, here's a contest for you! Pompeian and Hungry Girl are challenging bloggers to try grapeseed oil in their cooking. All you need to do to enter is to post a recipe that uses grapeseed oil on your blog. Then head over to the Pompeian’s Time to Change Your Oil Facebook app and share your blog link, enter your contact info and click submit...that easy! The winner will receive an all expense paid trip to BlogHer '13 in Austin, TX June 8-9. Plus, the winning recipe will be featured by Pompeian throughout the event. And on top of that, everyone that enters the contest gets a voucher for a free bottle of Pompeian oil! So, it's definitely worth it to enter! 1. Dry chickpeas thoroughly with paper towels. 2. Using a candy thermometer, heat oil in a large, deep skillet over medium-high until it reaches 355 degrees. 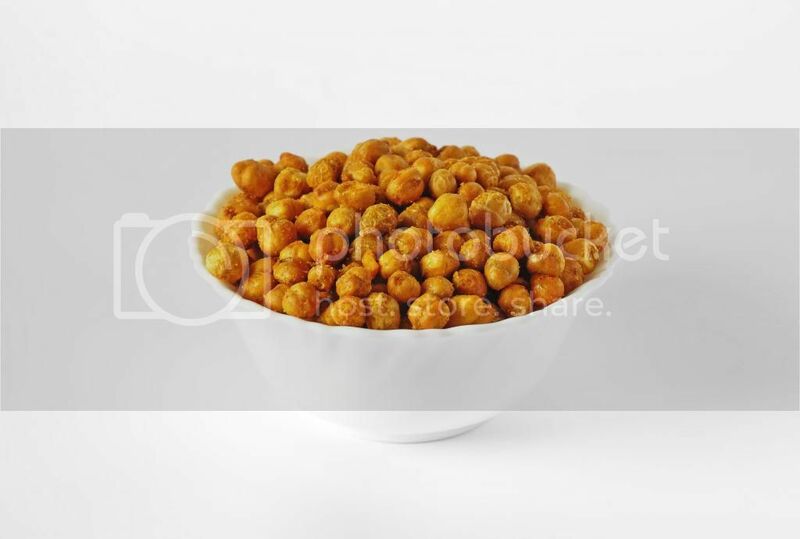 Add chickpeas, zest and thyme to pan in batches to avoid overcrowding. 3. Fry chickpeas for about 5 minutes or until deep golden brown. Remove to a paper-towel-lined baking sheet and sprinkle with paprika and salt. Serve immediately. 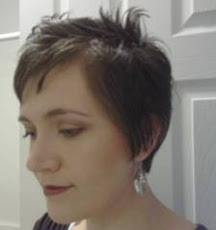 I'm quite excited about this contest and have a few ideas of what I want to do and I would LOVE to win a trip to BlogHer, I think it would be a blast! Why do you want to win? Comment below and let me know! 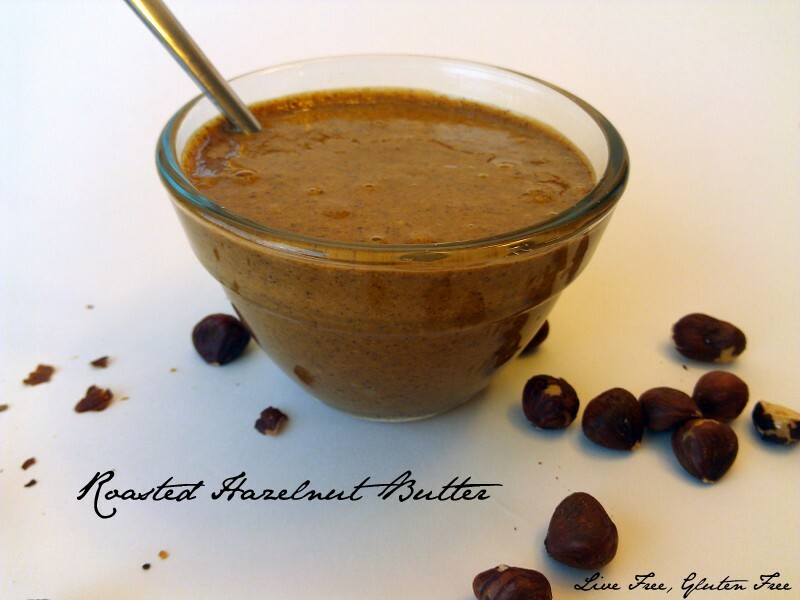 I am loving my homemade roasted hazelnut butter, and have been finding all sorts of ways to use it. This weekend I made myself this cake, and it is divine! It's quick to put together, but is elegant enough for special occasions, so enjoy it for anything and everything! This post was shared on Slightly Indulgent Tuesdays, Allergy Free Wednesdays, Gluten Free Wednesdays, Gluten Free Fridays, Whole Foods Friday, Allergy Friendly Fridays, and Allergy Friendly Lunchbox Love. Preheat oven to 325F. Grease and flour a 12 cup bundt pan. In a large mixing bowl, beat together the hazelnut butter, shortening, and coconut sugar until light and fluffy. Add in the eggs, one at a time, mixing after each addition, then add the vanilla. In a separate bowl, combine the flour blend, baking poweder, baking soda, and salt. Add the flour mixture to the hazelnut butter mixture, alternating with the milk and everything is incorporated. Beat well. Pour into the prepared pan and bake at 325 for ~60 minutes or until a toothpick comes out clean. To make the chocolate ganache, scald the milk in a medium saucepan. 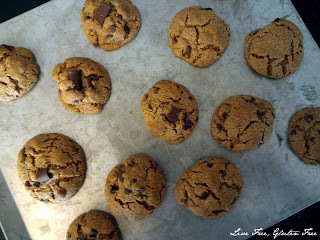 Remove from heat and add in the chocolate chips. Whisk until smooth and spoon over the cake. I also have carrots, celery, and apples. My older son is having tummy troubles, I'm working a crazy busy schedule at work, and my heart is aching for those affected by the tragedy in Boston. So, I just didn't have the energy to test recipes like I usually do. 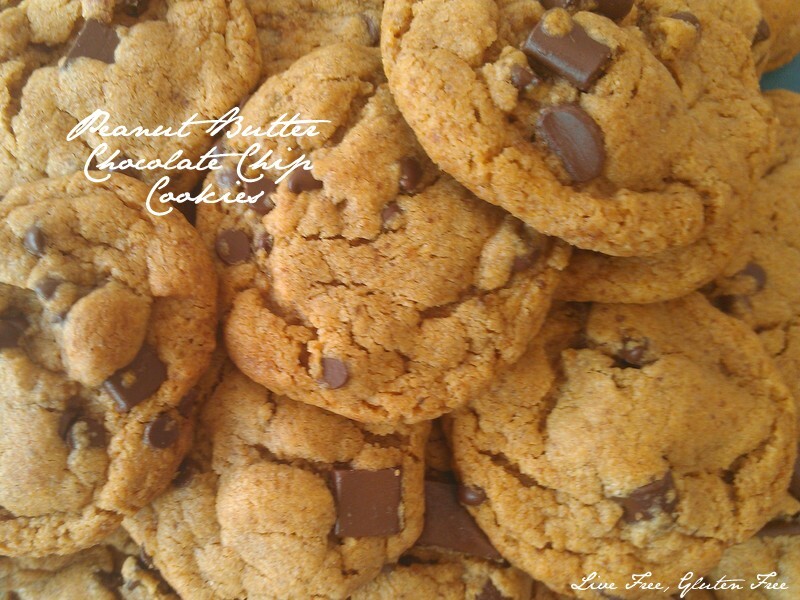 I do need to update my peanut butter chocolate chip cookie recipe, though, so here's my latest revision of my family's favorite cookie. Heat oven to 375 degrees. In a large mixing bowl, cream shortening, peanut butter, and coconut sugar. Add egg and vanilla, mix well. In a separate bowl, stir together the flour blend, baking soda, baking powder, and salt; add to butter mixture and mix well. Stir in chocolate chips. Roll into 1-1 1/2 inch balls and place on an ungreased cookie sheet. This post was shared on Slightly Indulgent Tuesdays, Allergy Free Wednesdays, Gluten Free Wednesdays, Allergy Friendly Lunchbox, Gluten Free Fridays, and Whole Food Fridays. I also have carrots and kale. dinner: The Cache Valley Gluten Free Group is meeting at Firehouse Pizzeria in Logan at 6:00 for our annual Restaurant outing! 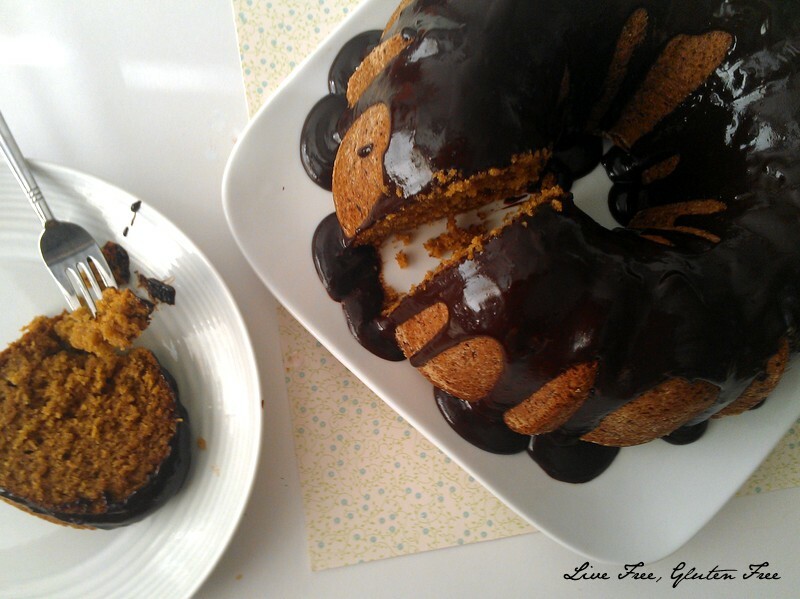 Do you love the combination of chocolate and hazelnuts? I think most people do, with the Nutella (and dairy-free versions of Nutella) craze going on. I love the combination. I was trying to think of how to have that combination yesterday while I was at work, and realized all to often the chocolate is the main flavor with the hazelnut as the accent and it really should be the other way around. Don't get me wrong, I love chocolate with hazelnut...but hazelnuts have such a rich, aromatic flavor, chocolate should enhance that, not cover it up. So, I decided instead of a chocolate cookie, or even a chocolate-hazelnut butter (i.e. 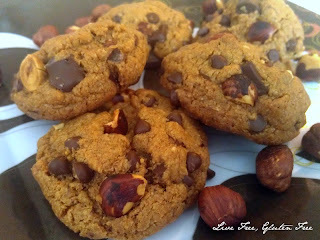 Nutella, or dairy-free Nutella) cookie, this needed to be simply a hazelnut cookie, and what better way to bring out the hazel nut flavor than with roasted hazelnut butter, and extra hazelnuts to boot. This cookie has that rich hazelnut flavor that is enhanced with the chunks of chocolate...really this is the right combination of hazelnuts and chocolate, at least in my book. 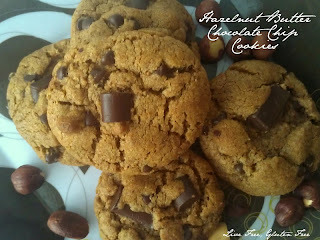 The extra hazelnuts are totally optional, but I love the texture that it brings to the cookie. This post was shared on Slightly Indulgent Tuesdays, Gluten-Free Wednesdays, Allergy-Free Wednesdays, Gluten Free Fridays, Whole Food Fridays, Allergy Friendly Fridays, and Allergy Friendly Lunchbox. Heat oven to 375 degrees. In a large mixing bowl, cream shortening, hazelnut butter, and coconut sugar. Add egg and vanilla, mix well. In a separate bowl, stir together the flour blend, baking soda, baking powder, and salt; add to butter mixture and mix well. Stir in chocolate chips and hazelnuts. Roll into 1-1 1/2 inch balls and place on an ungreased cookie sheet. Heat oven to 350F. Place hazelnuts on cookie sheet and roast for ~15 minutes. Remove from oven and wrap in a clean towel and allow to 'steam' for 5 minutes, then rub off skins. Place hazelnuts in a food processor or blender and blend until hazelnuts turn into a butter. With my blendtec, it only took a minute, but with a food processor, plan on at least a few minutes, if not longer. You can leave it plain or add a little salt. I also have carrots, kale, spinach, grapefruit, pears, potatoes, and green apples. The great thing about these scones, is they'd work minus the strawberries, or adding in blueberries, chocolate chips, or whatever else you can think of instead of the strawberries...so there definitely is flexibility here. Preheat oven to 400F. Spray a large baking sheet and set aside. 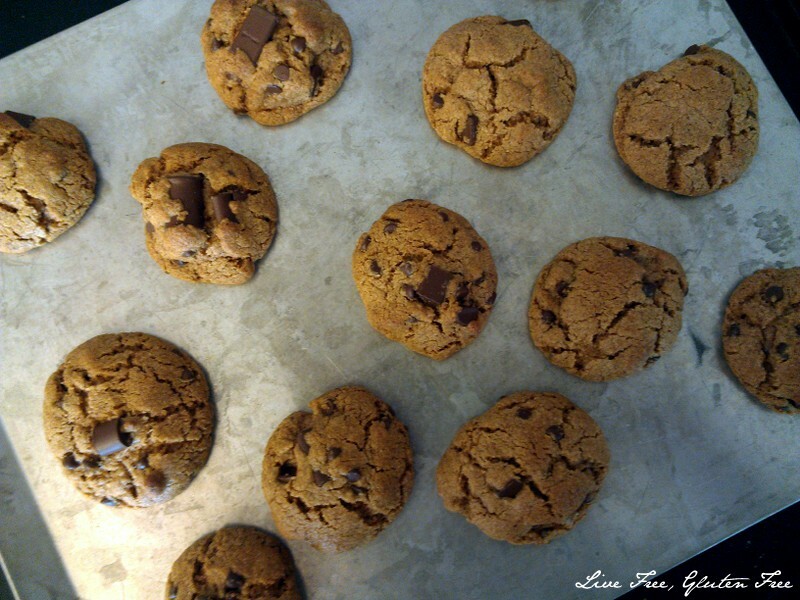 In a stand mixer, combine the flour blend, almond flour, coconut sugar, baking powder and baking soda. Add in the coconut oil and combine until the mixture resembles a course meal. In a separate bowl, combine the egg, almond milk, and vanilla. Add this mixture to the flour mixture, then add in the bananas and mix until combined. Fold in the strawberries. Using a 1/4 cup spring release scoop, scoop the dough onto the prepared pan. Combine the walnuts, evaporated cane juice, and coconut oil in a small bowl and press a small amount of the mixture onto the tops of each scone. Bake for about 15 minutes, or until the scones are golden brown and a toothpick comes out clean. Cool on a wire rack. These are best warm. 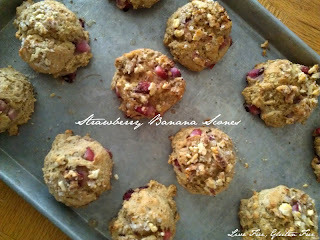 If you don't eat them all at once, store in an airtight container or freeze. This post was shared on Slightly Indulgent Tuesdays, Gluten Free Wednesdays, Allergy Free Wednesdays, Gluten Free Fridays, and Whole Food Fridays.